LETHBRIDGE, Alberta — The following are the unofficial results from the Bridge City Chrysler/LA Towing PBR Challenge presented by VisitLethbridge.com and Lammles on March 4th and 5th, 2016. Round one: 1. 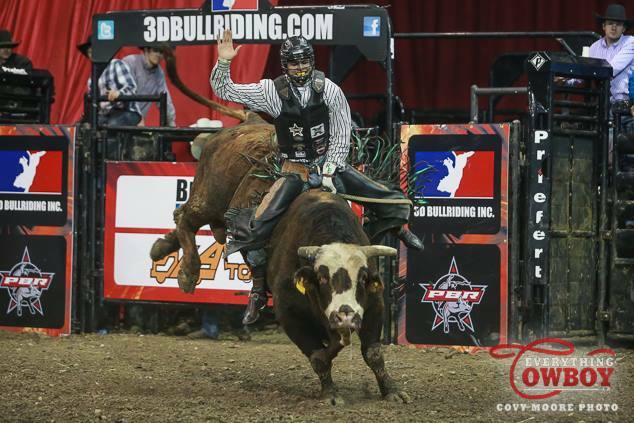 Tanner Girletz on Lazy R’s 739 China White, 86.5 points, $1,071.00; 2. (tie) Cawl Braithwaite, Dakota Louis and Dakota Louis 2, 86, $535.50 each; 5. Brock Radford, 85.5; 6. Wacey Finkbeiner, 85; 7. Jess Lockwood, 84; 8. Scott Schiffner, 83.5; 9. Garrett Green, 82; 10. Todd Chotowetz, 80.5; 11. Fabian Dueck, 79; 12. Shay Marks, 78.5; 13. Kale Marks, 78; 14. Riley Blankenship, 77.5; 15. Cody Casper, 76. Finals: 1. Shay Marks on Vold Rodeo’s 825 Feeling Blue, 87 points, $1,071.00; 2. Garrett Green, 86, $803.25; 3. Riley Blankenship, 85, $535.50; 4. Thor Hofer, 84.5, $267.75. Aggregate and total money won: 1. Garrett Green, 168 points on two bulls, $5,176.50; 2. Shay Marks, 165.5, $4,194.75; 3. Riley Blankenship, 162.5, $2,409.75; 4. Tanner Girletz, 87 points on one bull, $2,320.50; 5. (tie) Cawl Braithwaite, Dakota Louis and Dakota Louis 2, 86, $1,076.95 each; 8. Thor Hofer, $267.75; 9. Brock Radford, 85.5, $249.90. Riley Blankenship rides Braithwaite Ranches Wrangler Extreme to an 85 and the top score on two bulls on night two in Lethbridge at the Enmax Centre. Photo by Covy Moore. LETHBRIDGE, Alberta — The following are the results from night one of the Bridge City Chryslr/LA Towing PBR Challenge presented by Visit Lethbridge.com and Lammles. Round one: 1. (tie) Cawl Braithwaite on Two Bit Bucking Bulls’ 804 Devil’s Wing and Dakota Louis on Vold/Prescott’s 108 Overcooked, 86 points; 3. Brock Radford, 85.5; 4. Garrett Green, 82; 5. Todd Chotowetz, 80.5; 6. Fabian Dueck, 79; 7. Shay Marks, 78.5; 8. Kale Marks, 78; 9. Cody Casper, 76; no other qualified rides. Finals: 1. Shay Marks on Vold/Prescott’s 825 Feeling Blue, 87 points; 2. Garrett Green, 86; no other qualified rides. Aggregate: 1. Garrett Green, 168 points on two bulls; 2. Shay Marks, 165.5; 3. (tie) Cawl Braithwaite and Dakota Louis, 86 points on one bull; 5. Brock Radford, 85.5; 6. Todd Chotowetz, 80.5; 7. Fabian Dueck, 79; 8. Kale Marks, 78; 9. Cody Casper, 76. Garrett Green celebrates his night one lead in Lethbridge on March 4th, 2016. Photo by Covy Moore. 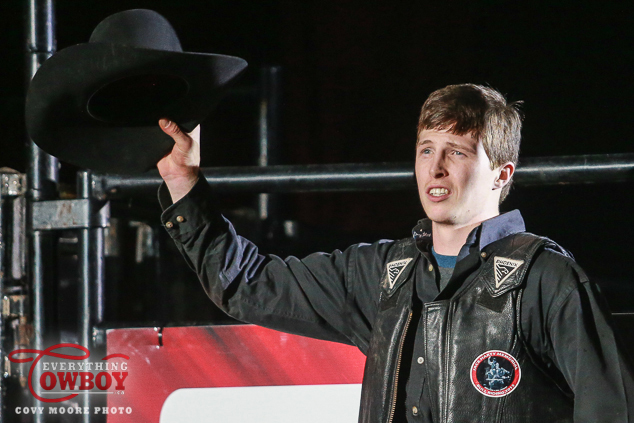 SASKATOON, Saskatchewan — For Tanner Byrne, his mind is set on a PBR World Championship. Before he takes on the world however he said he had to win the title in his home country. Tonight, he did just that. Highlights courtesy of the Sasktel Centre. The following are the official results from the 2015 PBR Canadian Finals at the Sasktel Centre on November 20th and 21st. Round 1: 1. Jordan Hansen on Flying High Rodeo Co.’s 076 Last Wish, 86.5 points, $1,600; 2. (tie) Aaron Roy and Cawl Braithwaite, 84.5, $1,000 each; 4. (tie) Dakota Buttar and Brady Oleson, 84, $200 each; 6. Jared Parsonage, 82.5; 7. Dakota Louis, 82; 8. Scott Schiffner, 81.5; 9. Beau Brooks, 81; 10. Tim Lipsett, 80.5; 11. Fabian Dueck, 79; 12. (tie) Cody Coverchuk and Tanner Byrne, 77; no other qualified rides. Round 2: 1. (tie) Brady Oleson on Flying High Rodeo Co.’s X232 I’m A Thug, Stetson Lawrence on Outlaw Buckers’ 108 Clouds in My Coffee and Bryan Titman on Wild Hoggs’ 818 Morning Breath, 85.5 points, $1,200 each; 4. (tie) Zane Lambert and Tanner Byrne, 85, $600 each; 6. Fabian Dueck, 83; 7. (tie) Beau Brooks and Nathan Schaper, 82.5; 9. Scott Schiffner, 82; 10. Aaron Roy, 81.5; 11. Wacey Finkbeiner, 80.5; 12. Devon Mezei, 73; no other qualified rides. Finals: 1. Zane Lambert on Outlaw Buckers’ OLS Tubs Come Closer, 89.5 points, $1,600; 2. Jared Parsonage, 87, $1,200; 3. (tie) Jordan Hansen and Fabian Dueck, 86.5, $600 each; 5. Brady Oleson, 85.5; no other qualified rides. Aggregate and total money won: 1. Brady Oleson, 255 points on three bulls, $10,640; 2. Fabian Dueck, 248.5, $7,040; 3. Zane Lambert, 174.5 on two bulls, $5,440; 4. Jordan Hansen, 173, $4,720; 5. Jared Parsonage, 169.5, $3,160; 6. Aaron Roy, 166, $2,400; 7. (tie) Beau Brooks and Scott Schiffner, 163.5, $980 each; 9. Tanner Byrne, 162, $760; 10. (tie) Stetson Lawrence and Bryan Titman, 85.5 points on one bull, $1,340 each; 12. Cawl Braithwaite, 84.5, $1,000; 13. Dakota Buttar, 84, $200. 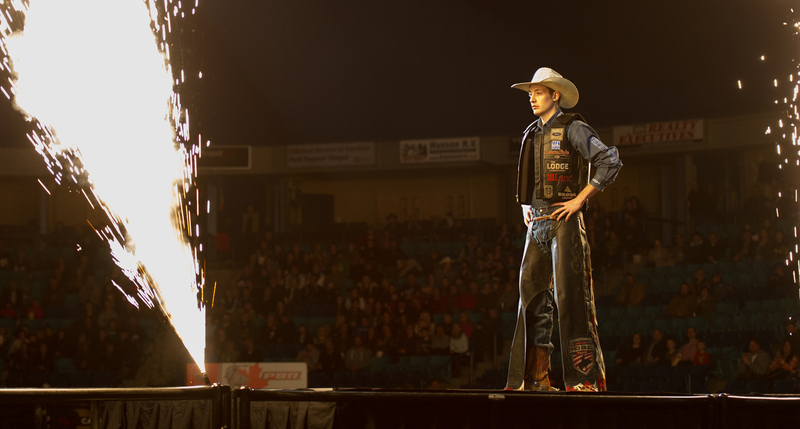 Tanner Byrne is introduced at the PBR Canadian Finals at the Sask Tel Centre Saskatoon, Saskatchewan, Canada on November 20th, 2015. Photo by Steve Hiscok/Sask Tel Centre. SASKATOON, Saskatchewan — Jordan Hansen of Okotoks, AB won round one of the 2015 PBR Canadian Finals from the Sasktel Centre. The following highlights come courtesy of the Sasktel Centre. Official results from the 10th anniversary PBR Canadian Finals in Saskatoon, SK at the Sasktel Centre on Friday November 20th. Round one: 1. Jordan Hansen on Flying High Rodeo Co.’s 076 Last Wish, 86.5 points, $1,600; 2. (tie) Aaron Roy and Cawl Braithwaite, 84.5, $1,000 each; 4. (tie) Dakota Buttar and Brady Oleson, 84, $200 each; 6. Jared Parsonage, 82.5; 7. Dakota Louis, 82; 8. Scott Schiffner, 81.5; 9. Beau Brooks, 81; 10. Tim Lipsett, 80.5; 11. Fabian Dueck, 79; 12. (tie) Cody Coverchuk and Tanner Byrne, 77; no other qualified rides. SASKATOON, Saskatchewan — The votes are in and the bull riders of the PBR in Canada have spoken. Bullfighter Brett Monea makes his fourth appearance in Saskatoon in two weeks from today. “I’m glad to be going back, thankful for the bull riders who voted for me and the promoters who hired me,” Monea, who’s wife Amy is due with their second child on November 30th, said. “The baby can come anytime after the finals,” Monea joked. Justin Keeley, brother of the late Glen Keeley, has judged every finals so far. This year’s personnel for the 10th edition of the Dakota Dunes Casino PBR Canadian Finals presented by New Holland on November 20th and 21st are as follows. Announcers Brett Gardiner of Sylvan Lake, AB and Dave Poulsen of Claresholm, AB make their 4th and 5th appearances respectively. Canadian Finals qualifiers and more are scheduled to be announced next week. Performances start each night from the Sasktel Center at 7:00pm on both Friday and Saturday November 20th and 21st. Tickets are available at Ticketmaster or by clicking/tapping on the logo below.